Two Sisters From The Right: Perry: "Gun Control Means Use Both Hands." Perry: "Gun Control Means Use Both Hands." We couldn't help posting this story early today. We feel that if Rick Perry answers questions tonight with the same honesty and wit that he used in South Carolina, he might just come out okay on the debates. Please remember that the moderators will be from Politico and NBC, both news outlets not favorable to Governor Perry. Also, both Ron Paul and Mitt Romney are on the offensive. This is his debate debut, and all eyes will be on him. It's probably going to be tough for him to fully concentrate on the debates as he searches for solutions to stop the fires raging in Texas. We suggest Ron Paul should show a little more concern for what is happening in his home state as well, but obviously his drive to become president is more important. To all those who are for the 2nd Amendment, this should be a story you enjoy. Story from Big Government. 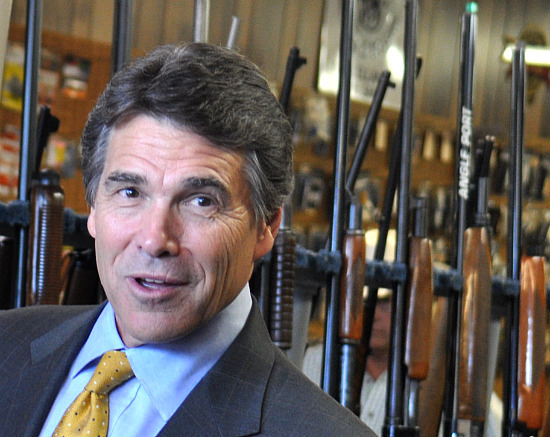 Governor Rick Perry: "Gun control means using both hands." As 2012 approaches, answers that would-be candidates on both sides of the aisle give to even the most random questions matter. And that’s because those answers – especially to random, unpredictable questions – don’t spring from briefings with staff as much as from raw conviction. Ah, the howling of laughter and thunderous applause returned. While it was obvious that Gov. Perry enjoyed the opportunity to demonstrate again his absolute love of the 2nd Amendment, something we should all be noticing by now is that Perry loves freedom – period. His love of freedom is not an extension of his love for guns rather, his love for guns an extension of his love for freedom. I’m not trying to over-parse things here. I just can’t help but notice how Gov. Perry’s unmistakable defense of the 10th Amendment over the last few years has already given him the reputation of a defender of something bigger than the 2nd Amendment alone. In other words, he’s literally been a defender of freedom itself. And through all this, on those same 10th Amendment grounds, Gov. Perry has defended the inherent right other states possess to choose a path that differs from the one Texas has taken. It just seems that Gov. Perry not only loves freedom but understands it. Thus we see the 2nd and 10th Amendments so clearly coalesced in him. Therefore, it was natural for him to look at the Tea Partiers Big Sis had maligned in 2009 and say: “I’m just not real sure you’re a bunch of right-wing extremists. But if you are, we’re with you.” And it was equally as natural for him to look out at that audience in South Carolina on Monday and tell them gun control means using both hands. It’s all part of being free. the game as the fifth game sometime in 2011 according to VGReleases.